Fortunately, "Kubrick/Tarkovsky" sheds only four and a half minutes of light, prolonged exposure to so many masterworks at once potentially being too much for many cinephiles to bear. For directors with such strong visions of their own, it might also come as a surprise to see such strong resonances between their images, such as Jack's walk into the Overlook Hotel's suddenly populated (and returned to the Jazz Age) ballroom from The Shining alongside Domenico's candle-bearing walk across the empty pool with a candle from Nostalghia and 2001: A Space Odyssey's journey through the "star gate" alongside Solaris' drive through Tokyo-as-humanity's-urban-future. Kubrick appreciated Solaris enough for it to make a list of 93 films he really liked, but Tarkovsky didn't feel the same way about 2001. "A detailed ‘examination’ of the technological processes of the future transforms the emotional foundation of a film, as a work of art, into a lifeless schema with only pretensions to truth," he said in an interview before he made Solaris, describing what he would get right that Kubrick had got wrong. From just the brief clips of those pictures included in "Kubrick/Tarkovsky," even viewers who have never seen either director's films can tell how differently they realized their visions of humanity's space-voyaging future. Throughout the rest of the essay as well, each emphasis on a visual similarity comes with an emphasis on deeper difference; as one of the video's commenters astutely puts it, "Tarkovsky is dreams, Kubrick is nightmares." Charlie Chaplin knew his movies were popular, but could he have imagined that we'd still be watching them now, as the 130th anniversary of his birth approaches? 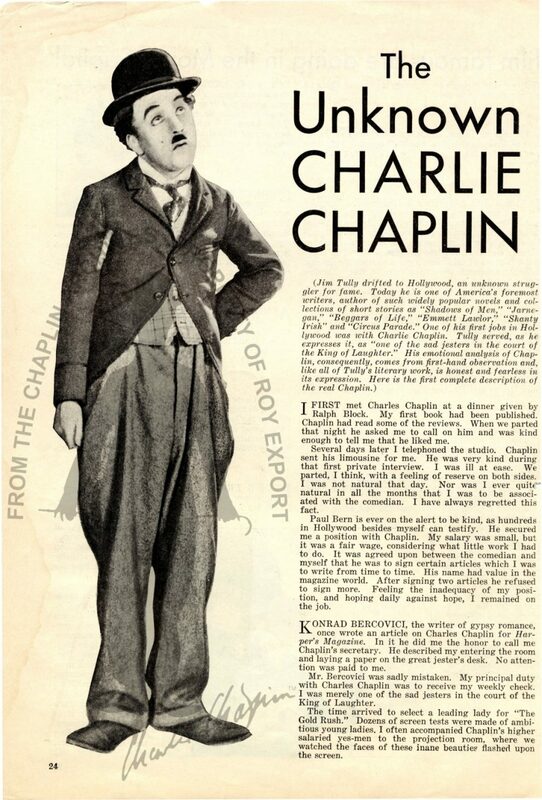 And even if he could, he surely wouldn't have guessed that even the materials of his long working life would draw great fascination in the 21st century — much less that they would be made instantaneously available to the entire world on a site like the Charlie Chaplin Archive. 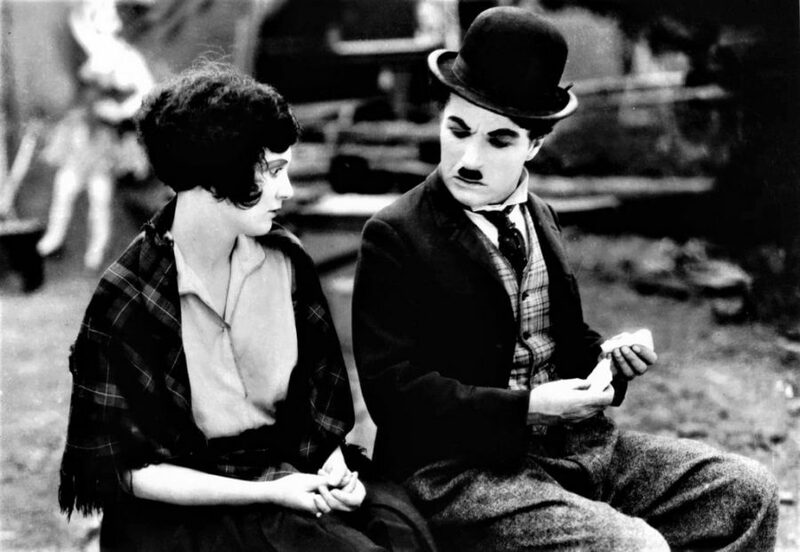 A project of the Fondazione Cineteca di Bologna, which has previously worked to restore and preserve Chaplin's filmography itself, it constitutes the digitization of Chaplin's "very own and painstakingly preserved professional and personal archives, from his early career on the English stage to his final days in Switzerland." This online archive includes everything from "the first handwritten notes of a story line to the shooting of the film itself, stage by stage documentary evidence of the development of a film, or a project that never even became a film," as well as materials not directly related to the movies: "poems, lyrics, drawings, programmes, contracts, letters, magazines, travel souvenirs, comic books, cartoon strips, praise and criticism." You can explore the Charlie Chaplin Archive by plunging straight into its collection of more than 4,000 images and nearly 25,000 documents, or you can enter through its curated topic sections: one on Chaplin's early career offers a glimpse into the humble launch of a cultural phenomenon that would go on to transcend cultures and eras; another on music shows Chaplin, who grew up in a musical family with musical ambitions of his own, conducting orchestras; and a section on travel presents clippings and photos related to his journeys to places like Bali and Japan, from which he returned on the same boat as Jean Cocteau. "Cocteau could not speak a word of English," Chaplin wrote in his autobiography of the voyage home. "Neither could I speak French, but his secretary spoke a little English, though not too well, and he acted as interpreter for us." 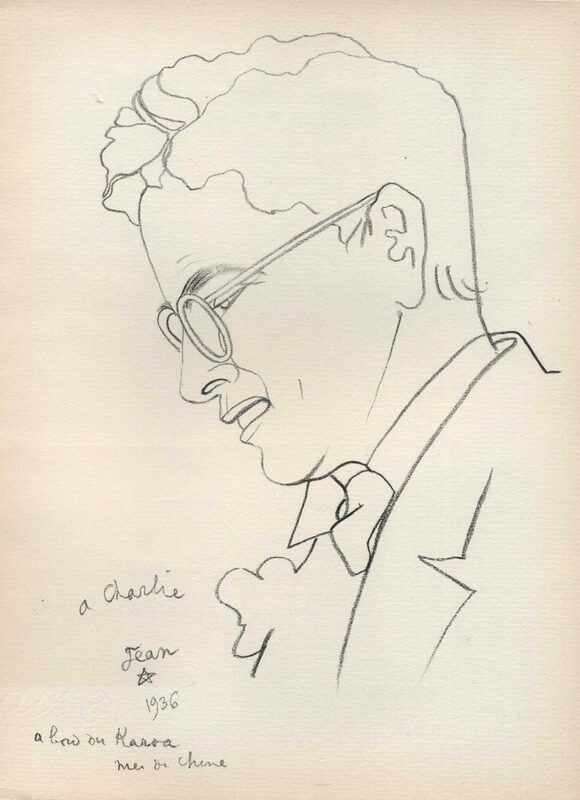 "That night we sat up into the small hours, discussing our theories of life and art," Chaplin continues, quoting Cocteau's secretary thus: "Mr Cocteau... he say... you are a poet... of zer sunshine... and he is a poet of zer night." These words, in turn, appear quoted (alongside the sketch of Chaplin by Cocteau above) on the Charlie Chaplin Archive's "Chaplin and Jean Cocteau" page, one of its continuously updated stories. 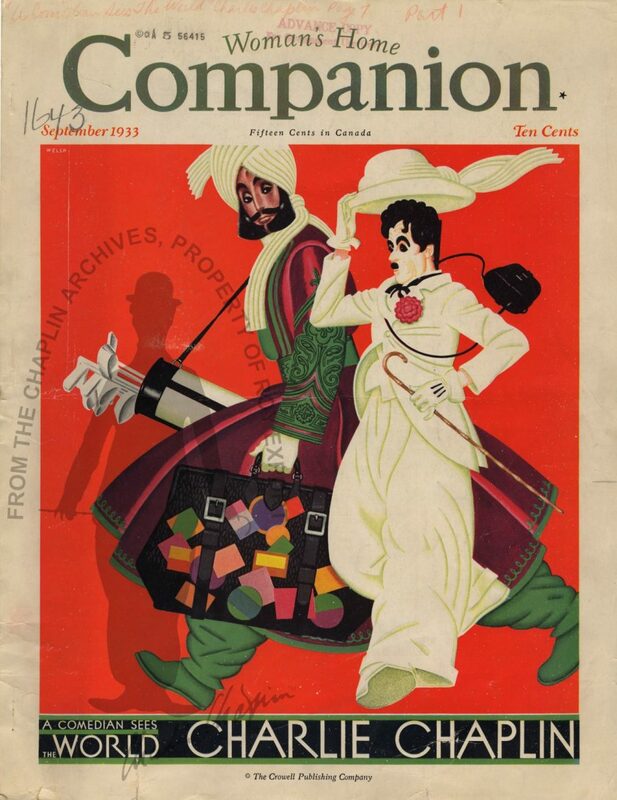 Others collect material related to Chaplin's luxury-item purchases, Chaplin as director, and Chaplin's final speech delivered as the title character of The Great Dictator, which a recent announcement about the archive calls "one of the most licensed elements of Chaplin’s work in the 21st century" — a time whose surreality Cocteau might well recognize, and whose absurdity Chaplin certainly would. The 1937 Nazi Degenerate Art Exhibition displayed the art of Paul Klee, Wassily Kandinsky, Georg Grosz, and many more internationally famous modernists with maximum prejudice. Ripped from the walls of German museums, the 740 paintings and sculptures were thrown together in disarray and surrounded by derogatory graffiti and hell-house effects. Right down the street was the respectable Great German Art Exhibition, designed as counterprogramming “to show the works that Hitler approved of—depicting statuesque blonde nudes along with idealized soldiers and landscapes,” writes Lucy Burns at the BBC. Viewers were supposed to sneer and recoil at the modern art, and most did, but whether they were gawkers, Nazi sympathizers, or art fans in mourning, the exhibit drew massive crowds. Over a million people first attended, three times more than saw the exhibition of state-sanctioned art—or more specifically, art sanctioned by Hitler the failed artist, who had endured watching “the realistic paintings of buildings and landscapes,” of sturdy peasants and suffering poets, “dismissed by the art establishment in favour of abstract and modern styles.” The Degenerate Art Exhibition “was his moment to get his revenge,” and he had it. Over a hundred artists were denounced as Bolsheviks and Jews bent on corrupting German purity. Not every anti-Nazi critic saw modern art as subverting fascism. Ten years after the Degenerate Art Exhibition, philosopher Theodor Adorno, himself a refugee from Nazism, called Expressionism “a naïve aspect of liberal trustfulness,” on a continuum between fascist tools like Futurism and “the ideology of the cinema.” Nonetheless, it was Hitler who most bore out Adorno’s general observation: “Taste is the most accurate seismograph of historical experience…. Reacting against itself, it recognizes its own lack of taste.” The hysterical performance of disgust surrounding so-called “degenerate art” turned the exhibit into a sensation, a blockbuster that, if it did not prove the virtues of modernism, showed many around the world that the Nazis were as crude, dim, and vicious as they alleged their supposed enemies to be. In the documentary, you’ll see actual footage of the theatrical exhibition, juxtaposed with film of a 1992 Berlin exhibition of much of that formerly degenerate art. Restaged Degenerate Art Exhibitions have become very popular in the art word, bringing together artists who need no further exposure, in order to historically reenact, in some fashion, the experience of seeing them all together for the first time. From a recent historical review at New York’s Neue Gallerie to the digital exhibit at MoMA.org, degenerate art retrospectives show, as Adorno wrote, that indeed "taste is the most accurate seismograph of historical experience." The original exhibition “went on tour all over Germany,” writes Burns, “where it was seen by a million more people.” Thousands of ordinary Germans who went to jeer at it were exposed to modern art for the first time. Millions more people have learned the names and styles of these artists by learning about the history of Nazism and its cult of pettiness and personal revenge. Learn much more in the excellent documentary above and at our previous post on the Degenerate Art Exhibition. Degenerate Art - 1993, The Nazis vs. Expressionism will be added to our list of Free Documentaries, a subset of our collection, 1,150 Free Movies Online: Great Classics, Indies, Noir, Westerns, etc. Echo In The Canyon celebrates the explosion of popular music that came out of LA’s Laurel Canyon in the mid-60s as folk went electric and The Byrds, The Beach Boys, Buffalo Springfield and The Mamas and the Papas gave birth to the California Sound. It was a moment (1965 to 1967) when bands came to LA to emulate The Beatles and Laurel Canyon emerged as a hotbed of creativity and collaboration for a new generation of musicians who would soon put an indelible stamp on the history of American popular music. Featuring Jakob Dylan, the film explores the beginnings of the Laurel Canyon music scene. Dylan uncovers never-before-heard personal details behind the bands and their songs and how that music continues to inspire today. Echo in the Canyon contains candid conversations and performances with Brian Wilson, Ringo Starr, Michelle Phillips, Eric Clapton, Stephen Stills, David Crosby, Graham Nash, Roger McGuinn and Jackson Browne as well as contemporary musicians they influenced such as Tom Petty (in his very last film interview), Beck, Fiona Apple, Cat Power, Regina Spektor and Norah Jones. The film will be released in LA on May 24th and in NYC on May 31st. If you lamented the demise of Filmstruck last year, you'll surely welcome the rise of the new Criterion Channel. It launches today. According to Criterion, the "new service will host the Criterion Collection and Janus Films’ ever-growing library of more than 1,000 feature films, 350 shorts, and 3,500 supplementary features, including trailers, introductions, behind-the-scenes documentaries, interviews, video essays, commentary tracks, and rare archival footage." In addition, you will get access to a "constantly refreshed selections of Hollywood, international, art-house, and independent movies." The Criterion Channel will launch in the U.S. and Canada. It can be accessed on desktop browsers and also apps for Apple TV, Amazon Fire, Roku, iOS, and Android and Android TV devices. If you sign up now, you can get a 14 day free trial. Find more information on the channel here. High school drama departments tend to work from a pretty standardized repertoire, which makes sense given the strict limitations they work under: short time frames, school-sized budgets, teenage actors. The elaborate, Hollywood film-like productions staged by Max Fischer in Wes Anderson's Rushmore speak to frustrated high-school theater directors and their fantasies about what they could put on stage with a bit more in the way of resources. But just this month, a real high-school drama club put on a show that out-Max Fischered Max Fischer, drawing not just the astonishment of the internet but the respect of one of the most eminent filmmakers alive. "A New Jersey high school has found itself the unexpected recipient of online acclaim and viral attention for its recent stage production of Alien, the 1979 science-fiction thriller," writes the New York Times' Dave Itzkoff. 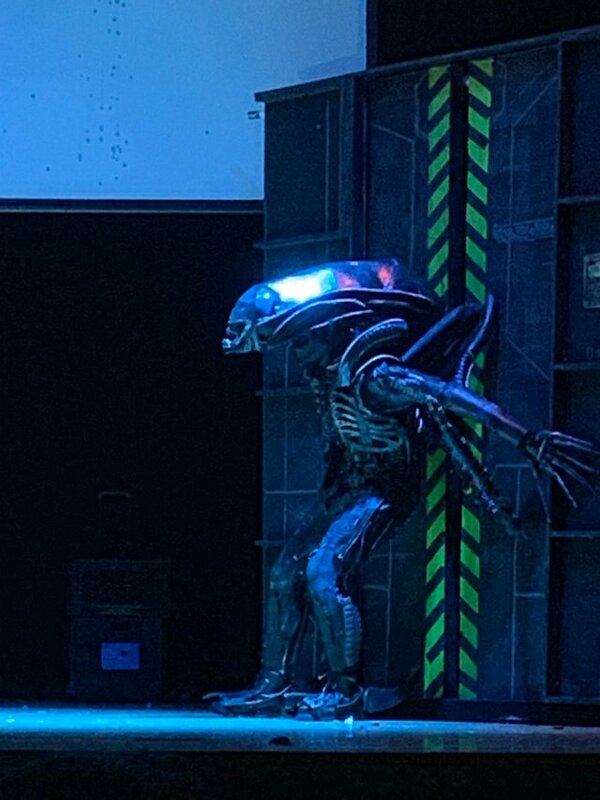 "Alien: The Play, presented last weekend by the drama club of North Bergen High School, starred a cast of eight students in the film roles originally played by Sigourney Weaver, Tom Skerritt, John Hurt and Ian Holm. Whereas the movie had a budget in the range of about $10 million, Alien: The Play had costumes, props and set designs made mostly from donated and recycled materials." Or as North Bergen student Justin Pierson put it in NJ.com's video on the surprise hit: "This is going to sound really funny but (the set crew) used garbage essentially." With that "garbage" — "just anything that was lying around, like cardboard and metal" — they built not only a set that convincingly evokes the dark claustrophobia of the space ship Nostromo, but a shockingly accurate-looking alien, the terrifying creature originally born from the mind of Swiss illustrator H.R. Giger. The young cast and crew get into detail about how they did it on Syfy's Fandom File podcast: "Much of the attention has highlighted and embraced their DIY approach," writes host Jordan Zakarin, and "they were endlessly creative in building the sets, with hand-puppet aliens, egg crate walls, a stuffed cat (the stand-in for Jones was a particularly ingenious idea), and other sweded props." 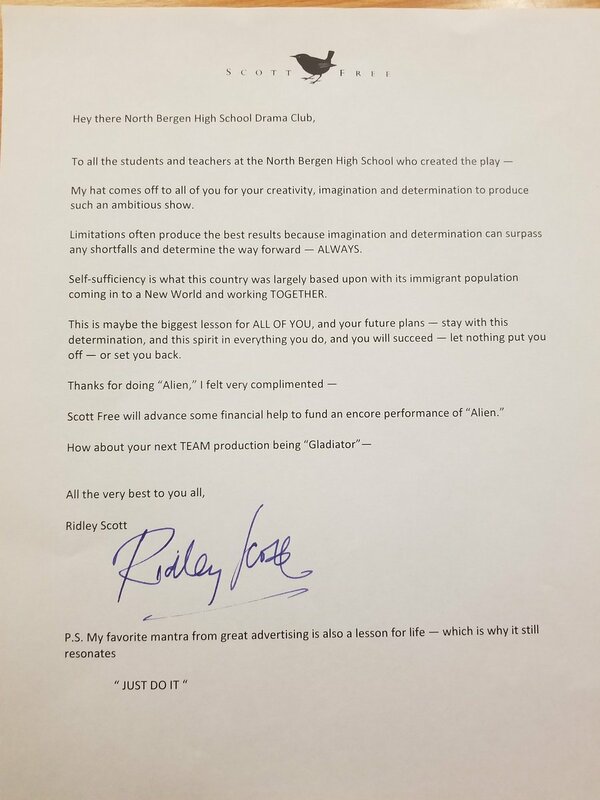 Responses to the video clips of Alien: The Play that have circulated on the internet include a personal congratulatory message from the original film's star Sigourney Weaver as well as a letter from its director Ridley Scott, which Alien: The Play's director, North Bergen English-teacher-by-day Perfecto Cuervo, posted on Twitter. "Limitations often produce the best results because imagination and determination can surpass any shortfalls and determine the way forward — ALWAYS," writes Scott, who has built his reputation in the film industry on taking firm and decisive action in the face of any and all production difficulties. He also offers both the funds for an encore production as well as a suggestion: "How about your next TEAM production being Gladiator." No doubt Cuervo and his enterprising players are feeling pretty vindicated in their decision not to do Our Town right about now.